by the way, does anyone know what the initials V.T. 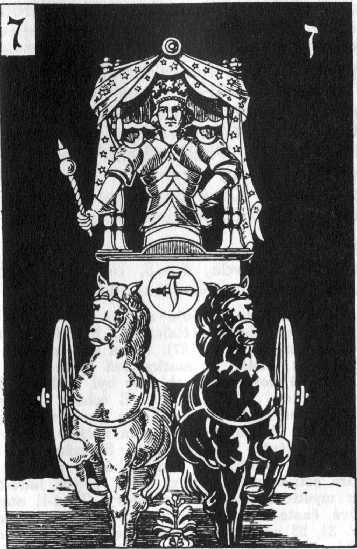 on teh chariot's shield stand for in the conver deck? 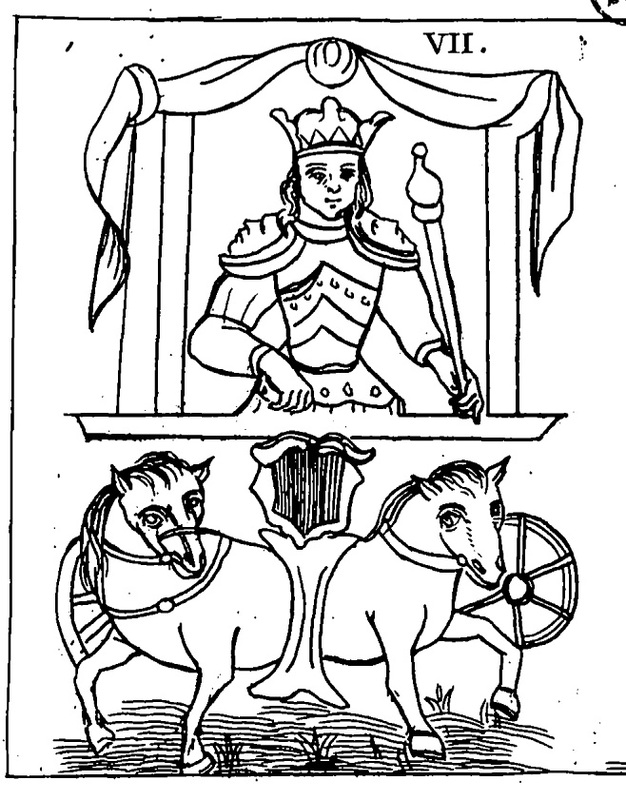 Gérard van Rijnberk, in Le Tarot. Histoire, iconographie, ésoterisme (Lyon, Paul Derain, 1947; facsimile reprint, Guy Trédaniel, 1981), p. 82, note 14, accidentally gives us a plausible solution to the initials V.T. “Il faut avertir ici le lecteur de ne pas se perdre en vaines recherches sur la signification des lettres majuscules qu’on trouve dans beaucoup de jeux de Tarot sur l’écusson du Chariot. Sur cette carte, dans le jeu dont s’est servi Court de Gébelin, on lit : V.T. ; avec quelque fantasie, on serait tenté d’interpréter ces deux lettres ainsi : Victor Templarius, ou quelque chose semblable ! En réalité, cet écusson sert souvent aux fabricants de cartes pour y mettre leurs initiales ! Ainsi, on trouve sur un jeu édité en 1783 par Rochas Schaer, à Mumliswil, en Alsace, les lettres R.S. Dans le cas cité plus haut, V.T. peut signifier Veuve Toulon, fabrique de cartes ayant existé à Marseille de 1750 à 1755”. I say “accidentally” because Court de Gébelin’s Chariot shows no initials at all. Where did van Rijnberk get this idea? Clearly he was reading some other source than Court de Gébelin himself, or at least a copy of Court de Gébelin which used illustrations from Conver or some other deck with V.T. on the Chariot. Cool. Another mystery bites the dust. very interesting. definitely a reasonable possibility (i wish some of those books were available to us in english!) do we have any evidence of veuve toulon publishing a deck of cards with her intials? this would indicate the existence of plates with the initials v.t. being used by her business. also, if she inherited the business from her husband, wouldn't we expect that he would have already been making cards with his own initials (j.t. or I.T.) on the chariot? Just talking about this famous author Gérard Van Rijnberk, I checked carefully about his Planche III from his book (in french only alas): Le Tarot Histoire Iconographie Esoterisme. See Ross Caldwell thread up. In fact this famous Planche III is from Carrajat C. François who was NOT cardmaker in Marseille but in Chambéry France. When we read his text page 81 and 82, we can think that he talks about Feautrier who was effectively a cardmaker in Marseille has he mention. So.... I do agree with Ross that G.V. Rijnberk was a little disturb when he wrote his book. Same problem with his note 14 when he mention that Rochas Schaer was born in Mumliswil (this is right) BUT locate Mumliswil in Alsace (France région from East).... in place of Swissland. Mumliswil is part of Solothurn region/Canton. All in one, I think that his theorie about V.T = Veuve Toulon is "may be" right but this author is not very serious in his sources generaly speaking. Even if a Veuve Toulon may well have lived. By the way may I suggest that Nicolas Conver is may be NOT the author of his famous deck. But this is another story that I still explore. "In some old Tarot Keys the shield bears the letters .V.T, written with the periods at the left of the letters, to show that they are to be read, like Hebrew, from right to left. Sp read, they spell the Hebrew word TV, Tav. This is the name of the last letter of the Hebrew alphabet. To an occultist this conveys the same fundamental idea as the lingam-yoni, because the original character fot Tav was a cross, combining the vertical masculine line, with the feminine horizontalm like the cross on the breast of the High Priestess"
But unfortunatelly was not able to find the card Mr Case mentioned above written as .V.T. Is someone familiar with these initials? Paul Foster Case in the tarot A key to the wisdom of the Ages: "In some old Tarot Keys the shield bears the letters .V.T, written with the periods at the left of the letters, to show that they are to be read, like Hebrew, from right to left." 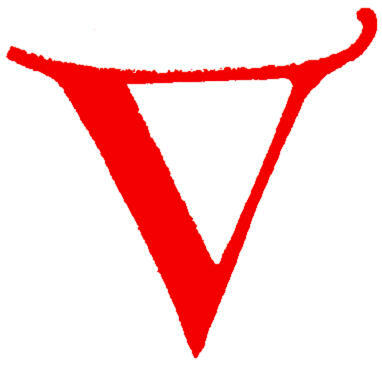 The "weight" of the capital V is emphasized on the (initial) LEFT stroke. V. T could be........ Vive Tourrasse ? Some posts seem to be taking an occult turn, and I wouldn't rely on the downstroke of the V as some cards were printed backwards.